Peter's fourth book, 'Bunny', is now available, and is already proving to be a popular story with younger children. The artwork in Bunny is unique as it has been cut from paper and the story has an unexpected twist part way through. 3 more books for 2018! Peter is very pleased to announce that he is currently working on 3 more books due for release in 2018. ​'Bunny' is scheduled for an Easter release. The artwork has been created by Clare Lindley and the book is currently being created. ​The sequel to 'Madeleine Goes to the Moon', called 'Madeleine Goes to the Sunken Shipwreck' is written and Charlie Roberts will be starting work on the illustrations soon. No release date is set for this yet but watch this space. Sadly Madeleine Goes to the Moon​ did not win the People's Book Prize but it was an achievement to make it to the final all the same. Congratulations to the winners in each category and a massive thank you to everyone who took the time to vote. ​Madeleine Goes to the Moon​ is officially one of the winners for Winter 2015 and has made it to the finals of the People's Book Prize. Watch this space for more news, as there will be an additional round of voting starting in May 2016 to determine the overall winner. The winner will be announced at the award ceremony in July, broadcast on Sky News. 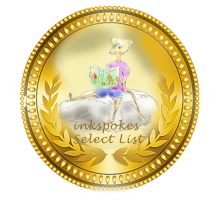 ﻿I am extremely proud to announce that my debut book, Madeleine Goes to the Moon was selected as a winner of the first 'Inkspokes Select Books Award' in the Picture Books category. This was a huge surprise and made me feel, I have to say, over the moon! To quote Inkspokes directly: "The Inkspokes Select Books Award recognizes books that are not only well written but that, in their originality, passion and freshness, make us passionate about reading again. The authors of these books care deeply about their characters, their stories and their craft. At their best, they bring us a fresh way of looking at our world, they remind us of things that matter, small things and forgotten things also — and, with it all, they give to us wonderfully engaging characters and stories that we might share with our children and each other." Please follow the link to find out more.